I don't feel like I was very productive this year, and frankly I was surprised to see that I made 23 garments in 2009, it felt like less. I'd love to say I will sew more in 2010, but with a baby on the way, I think that would be setting myself up for failure. Unless burp cloths count. I got compliments every time I wore BWOF 7-2009-104, the shirred waist shirtdress. The 1950's silhouette is not normally my thing, but this dress has a special place in my heart, and wardrobe. 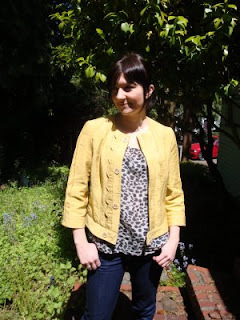 I think I wore this scalloped edge summer jacket, BWOF 6-2008-102, every other day last summer. The only downside is that it doesn't have pockets. 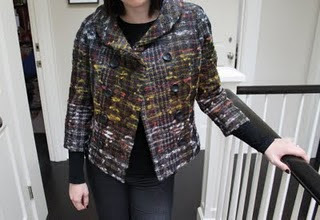 I fought first trimester fatigue to make this jacket, BWOF 9-2009-127 in Carolina Herrera wool coating, and it was worth every minute because I feel like it came straight from a Neiman Marcus catalog. 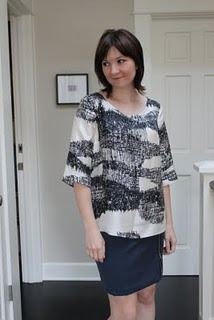 I reached for this top, BurdaStyle Ellinor tunic download 8516, and a pair of heels whenever I wanted to dress up for dinner or a gathering with friends. Wish I had 5 more like it. 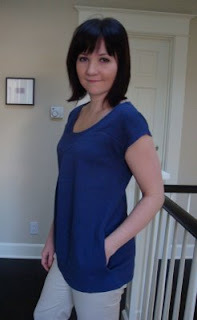 I used a stretch linen to make BWOF 7-2008-107, and the neckline was so stretched out, there was always a bra strap or two showing when I wore this. Took it to Goodwill a while back, hopefully it worked better for someone else. Happy new year and here's to a productive year of sewing in 2010! You had an amazing year. I love everything you've made. I look forward to seeing what you create in 2010. The interesting thing about your collage is that ALL of your garments look like you! So if you only made 23 pieces this year, you did an amazing job of making just the right thing for your style. It will be interesting to see how the impending birth of the baby affects your sewing in 2010. Happy New Year and many wishes of good health and an easy pregnancy for you! You made 23 garments in 52 weeks. I am so impressed ... and a lot of them worked, even more impressive. ALL your garments look top-notch - yes even the loser = a beautiful tunic top. Best wishes for a knockout 2010! We all know it will be just that (get ready!!!!!). I think all of your 2009 work was wonderful. At risk of sounding like a crazed fan, I really love all the garments you make. There isn't one item from 2009 that I wouldn't want to own. Looking forward to seeing what 2010 brings. Wow, you did a lot this year! 23 garments is an accomplishment. What struck me is that most of your projects were a fair amount of work :) I am very interested in making the Tunic from BWOF 7-2008 which you say didnt work out. It looks awfully cute though. I am thinking it'll be a perfect choice for the new blue embroidered fabric I got from India. Any idea why the neck stretched out? Congrats on the pregnancy! It'll be interesting to see if you continue to sew only for yourself, only/mostly for your new dd, or both. I was usually too tired to do much sewing when my children were little, but the majority of what I did was for them. Little girls are just so much fun (IMHO) to sew for. I don't know if you like smocked garments, but it's a fun (albeit time-consuming) technique to learn for baby. Thanks for the pics from Germany. Although it's also my heritage, I've never been there myself. Your pictures are magical, and I'm thinking that perhaps GOING there for Christmas might help bring back that specialness for me. I grew up in the midwest, but have lived in Phoenix for the past 20+ years, and having no snow for Christmas just isn't the same. Also, the pictures bring back some special memories about my dad. He would have LOVED those meat shops - especially if they had sausages (and it looks like they have plenty!) LOL! They also remind me of my maternal grandma's house. Thank you. Wow, you made a lot of wonderful garments! Every piece is reflecting your personal style! Happy new year! How did I miss that zipper skirt???? Love everything you've made! Look at all those fabulous garments!!! I too love that old cowl neck pattern, it's one of my go-to favs. Sorry the New Year's dress didn't work out, that stinks! I love your style! I'm glad you love the jacket you made during your first trimester. Anything I made during mine just brings back feelings of nausea. No joke! Great year in review - you have some amazing garments there. You favourites are my favourites too. Happy New Year! Wow, you're stuff is always impeccable, and then to see it all in one place...can't wait to see what you produce in 2010. Perhaps some cute baby togs, in addition to fabulous clothes?